I almost didn't buy this book. 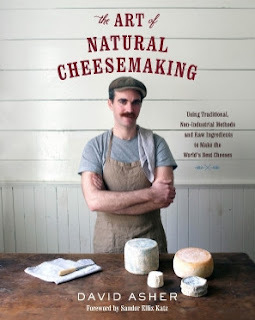 While The Art of Natural Cheesemaking: Using Traditional, Non-Industrial Methods and Raw Ingredients to Make the World's Best Cheeses by David Asher got a lot of really good reviews over at Amazon, I also took a look at the one- and two-star reviews. One of them claimed that the book read like a political manifesto. I couldn't imagine what that meant, but I can tell you that I am not all that impressed with politics. Yes, I vote and try to be a good citizen, but blind party loyalty, party bashing, and trying to turn everything into a political weapon is not my cup of tea. The last thing I wanted to read was somebody on a political rant. I took the chance and bought it anyway. Happily it contains no rants, just a straightforward logical arguments for using traditional, non-industrial methods and raw ingredients to make cheese. It turned out to be the cheese making book I've been looking for. When I first started making cheese, I bought Ricki Carroll's Home Cheese Making. While I found it informative, I knew I did not want to be dependent on buying cheese cultures. That doesn't fulfill my goal of increased self-sufficiency. My first cheeses were based on the recipe in The Little House Cookbook, substituting whey for buttermilk as a starter. My cheeses have been okay, but I've been wondering how to make them better. I think I've found my answer. David's cheesemaking utilizes raw milk, kefir, good quality salt, and calf rennet tablets. He gives very thorough explanations for his preferences and why he chooses these over other ingredients. The simplicity of these ingredients plus the variety of cheeses he makes are what is exciting to me. He teaches how to make cheese by cheese types: yogurt cheeses, paneer, chèvre, aged chèvre, basic rennet curd cheeses, pasta filata, feta, white-rinded, blue, washed-rind, alpine, gouda, cheddar, and whey cheeses. Also included are chapters on the philosophies of the various methods of making cheese, making kefir, cultured butter, sourdough, and cultured whey starters. He discusses how to cultivate the bacterial cultures sometimes used to develop specific types of cheese. There is an excellent discussion on rennet too (similar to my "What I'm Learning About Rennet" post) including a how-to on making calf (or kid) rennet. 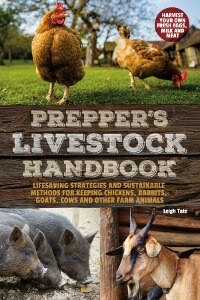 Chapters on cheese making tools with the pros and cons of each material, homemade tools, salt as an ally, the cheese cave, and troubleshooting round out the book. If you don't have access to raw milk, you likely will feel that the book is a waste of money. If you have your own milk-producing animals or access to raw milk, and are looking for a more traditional, low-tech way of making cheese, then you will find this book to be a good investment. My plan is to start at the beginning of the book and work my way through the various cheeses and techniques. Soon I'll be showing you what I'm learning! I'm seeing two of my problems are probably not enough salt, and improper curing temperature. I don't have a cheese cave and haven't really wanted to buy something to serve as one. My pantry temperature is not ideal, and I can see how this if resulting in a very hit-or-miss cheese. I usually steer clear of the one and two star reviews on Amazon because they always seem like they have an ax to grind. I also steer clear of the five star ratings because they usually offer no insights. For me, I go straight to the three and four star ratings because they generally offer up some ways it could be better which often times lets me know whether or not it is something I want to purchase. I've never been much of a cheese eater for some reason. But I do admire your efforts to make your own cheeses. It's always satisfying to make something for yourself. Leigh - i can't wait to read about your cheeses....but instead of showing us them, can you just send them???? bahahahha! as for kefir, where does he get his starter? does he keep it going? does he make a kefir cheese? soooo many questions. this a very good breakdown of his book and you should copy and post this post to the amazon reviews. Cheese making is a lot of fun and very rewarding, but there's a knack to it, just like learning to make bread. Still, nothing beats it! I have to agree about the Amazon ratings and honestly don't find them very useful anymore - but I still read them! The best ones give the reasons for their rating. Quite a few of the one- and two-star ratings seem to be angry about something else: service, delivery time, or the didn't read the description and then ding the item because it wasn't what they wanted. 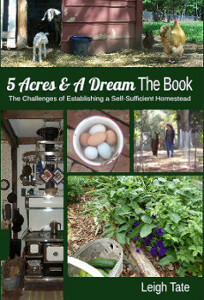 I've gotten some low ratings for 5 Acres & A Dream The Book and when I read them I honestly wonder if they even read it! I think Amazon has been making changes in the ratings. I've had several people tell me they've tried to leave reviews for Critter Tales which were rejected. I have no idea what's going on there. We need a cheese-tasting party!!! For the kefir he nixes store-bought because it isn't true kefir. He suggests health food stores, craigslist, or looking into online sellers. He bought his from someone in Toranto, but he doesn't get more specific. The thing about kefir is that you only need to get the grains once. If they are taken care of, they proliferate and live forever. That's the main reason I switched from making yogurt to kefir, so I wouldn't have to continually buy the starter culture. I love this book! I've made a ton of cheese (35 and counting) using his method, modifying other recipes for using kefir. You can change any recipe, just replace all the "regular" cultures with kefir, and culture for 1 hour. The proceed as written. I've made Jarlsberg, Caerphilly, Jack, Farmhouse cheddar, Asiago, Manchego and a bunch more, all using kefir as the culturing agent. For the Jarlsberg (and the blues that I'm working on), I do add the freeze-dried cultures appropriate to the particular cheese. You do need a cave. I scored a 158-bottle wine fridge on Craigslist last fall, after it was apparent that the large mini-fridge was getting full very quickly. I still use the mini-fridge, it has an external temp controller. Currently, it has blue cheese in it (I don't want the blue "infecting" the big cave), but I also used it for the Jarlsberg, which has to be aged at 65* for part of the hole-making process. I'm trading cheese for 3 of my 4 goats, and today, I have enough milk to make cheese with my own milk!! I've been buying raw goat and cow milk, and make 2 cheeses a week - now I can make more than that! I love the use of kefir - it's not a monoculture, which gives the cheese a real depth of flavor that I suspect is lacking in the single-culture cheese. Have a good time with it!! Well made kefir is a thick liquid, yes, but not gelatinous like yogurt. The key is the correct amount of grains. When the grains are overpopulated, they produce a thin product, so I know to removed some and cut back on the amount I'm adding to the milk. My yogurt was probably a bit thicker, although not as thick as commercially made, where they add thickening agents to get a certain consistency they think the public wants. As you point out, lacking any source of raw milk I'm not really in a position to make cheese. But I wish I were. That's been a staple in the diets of a great many cultures throughout history and would be a wonderful asset for people interested in self reliance. Can't wait to see what you make from this! I've never made cheese but have been recently itching to give it a try. I'll be watching for updates! Awesome! I look forward to your testing the recipes. I also know you will bend them a little for the sake of science! This looks like it'll be just the ticket when we move on to our land, thanks for sharing! Very true, Harry. It's a great way to preserve milk. But it does take a milk-producing animal! Ricki Carroll's is a good book too, especially if you can't get raw milk and want to go with purchased cultures. The only glitch is that ultrapasteurized milk doesn't work for cheese. You have to find milk that has undergone only the old fashioned simple pasteurization. I think I'll start with following each recipe to a "T" and learn from that. I've already tried his quick mozzarella, but had not-so-good results. Now I'll experiment to see how I can make it work for me! That's fantastic about the Jersey milk. Any idea what went wrong with the butter? The biggest factor seems to be getting the cream at the right temperature - 50-60°F (10-15°C). Oh gosh, I know you must be looking forward to that so much. :) If you want to work with simple raw materials, this is the book for you. Your comment about reading the one and two star reviews makes me smile. I do that too. :) Oh, and I agree with you about politics. I think anything politicians say ought to carry the disclaimer, "for entertainment purposes only," because it's rare that any of them do what they say their going to do. Politics is, however, an excellent way of keeping people divided.